When DHHS delivered the HIPAA Security Rule Crosswalk, we were able to support it in its entirety. 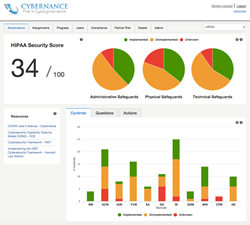 Cybernance launched today a major update of its cybersecurity governance platform to fully support the recently announced HIPAA Security Rule Crosswalk. Organizations seeking compliance with both NIST and HIPAA standards can now conduct automated assessments. Cybernance’s platform measures and monitors 300 enterprise security controls specified within the ten domains of the Cybersecurity Capability Maturity Model (C2M2) developed at the Department of Energy, and it reports them across the NIST Framework’s three dimensions. Now similar controls power the new HIPAA console. By fostering and archiving communication with cybersecurity management and indemnifying directors against litigation expenses, the standards-based solution protects corporate board members and executive management from significant personal liability after a breach. Cybernance is an Austin-based startup founded by former officers of Infoglide Software, a cybersecurity company sold in 2013 to FICO. Its SaaS governance solution provides visibility and oversight enabling corporate directors to actively engage in overseeing cyber risk and protecting them from personal liability for cybersecurity breaches.